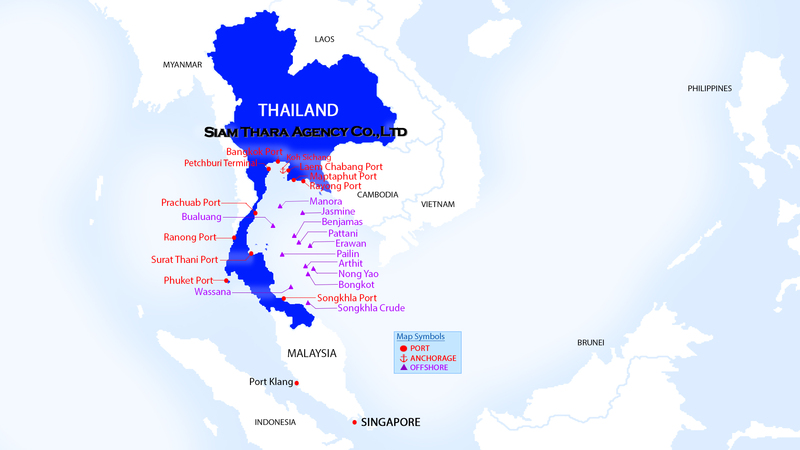 Over time Siam Thara Agency has developed a reputation as a leading port agent in Thailand. Siam Thara Agency’s port agency offers a reliable nationwide 24-hour service. The employees are all qualified professionals and attending agents have extensive experience in serving the industry. Siam Thara Agency is a full service agency company representing both owners and charterers in a professional manner. Our extensive experience in the business will leave you satisfied that the interests of all parties are secured with minimal conflict. Protective agents responsibilities are specific in the requirements of the clients. We offer a fully customizable service to allow adequate protection of your commercial and legal interests locally and in real time. We offer comprehensive advice on ports, logistics and commodities both on the export and import fronts in Thailand and are considered leaders in our handling of all other miscellaneous elements of port logistics. Communication is key to an effective turnaround and our IT and support systems ensure that this remains foremost in our endeavors to serve you as a client of Siam Thara Agency. Nortrans Express Pte Ltd. which is performing regular bulk/break-bulk liner services between Laemchabang, Maptaphut, Port Klang, Singapore and other South East Asian ports. Orient Asia Lines which is performing regular bulk/break-bulk liner services from South East Asia to the Middle East and Eastern Mediterranean with handy size and supramax tonnage. Sailing frequencies based on customers’ requirements.